The 2014 Beetle Sunshine Tour is celebrating its 10th anniversary on August 15 with nearly 400 Beetles from three generations signed up. Travem�nde beach, Wolfsburg  plus, live music from the 'voice of Germany' Ole 'Soul' Feddersen and much more. To make sufficient space for all the Beetles, the tour is for the first time starting this year from L�beck Airport and finishing up in Br�gmanngarten in Travem�nde. More than 400 vehicles and up to 4,000 guests and spectators will be coming together on the Baltic coast to celebrate. One of the many attending Beetles will be crowned 'Most Beautiful Beach Beetle' at the event. One of the highlights of the Sunshine Tour is the way participants dress not only themselves but their cars as well. 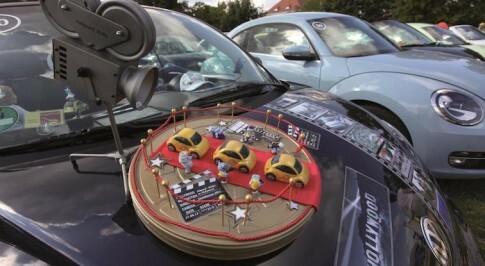 Be it Glamour Beetle, Crochet Beetle, Rock'n'Roll Beetle or Beach Beetle, there is a free choice of theme and coming up with the most original interpretation is key to winning the coveted title. Official partners, Volkswagen, will be in attendance with a number of special vehicles including the Beetle Dune concept car and the recently launched Beetle Cabrio Karmann. Organiser Gaby Kraft said: "It always thrills me to see the great creativity and passion that the participants put into designing their vehicles". Another real eye-catcher will be the GRC Rallycross Beetle, a 536bhp four-wheel drive car that has been developed in conjunction with Andretti Autosport for the American GRC race series.